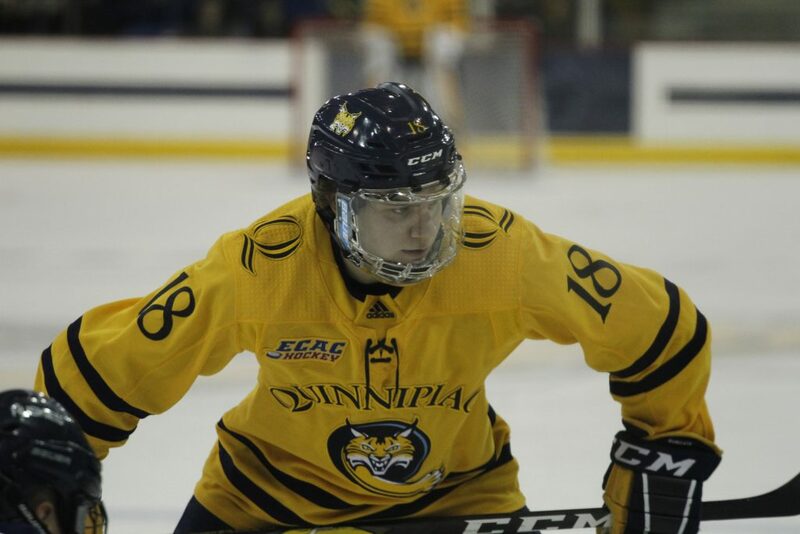 The Quinnipiac Bobcats (2-0-0, 0-0-0 ECAC Hockey) will host the No. 18 Boston College Eagles (0-2-0, 0-0-0 Hockey East) on Friday at 7 p.m. in Hamden. After a disappointing 2017 season, the Bobcats are off to a great start in 2018 having won their first two games. The Bobcats won their home opener on Tuesday night, beating the UConn Huskies 4-2. On the other side, Boston College is looking to pick up its first win of the season as they dropped their first two games of 2018 to Wisconsin by scores of 3-0 and 7-5. After leading the Bobcats in points last season as a freshman, Tufto has already jumped out to a hot start in his sophomore season scoring two goals in his first two games. It would seem there is no sophomore slump coming as he is well on his way to surpassing his nine goals from last season. If Tufto is playing well he can be a problem for any defense, and that’s exactly what he figures to be against Boston College. He is also making strides in his transition from wing to center as he was much better in the faceoff circle in the Bobcats last game against UConn. Wahlstrom, a freshman, wasted no time scoring his first collegiate goal, as it came in just his second career game in the maroon and gold. He tallied 48 goals and 46 assists for 94 points and a league leading plus-minus of +30 for the United States Under-18 National Team last season. He was selected 11th overall by the New York Islanders in this year’s NHL Entry draft and figures to make a big impact for this Eagles offense this season. Although Quinnipiac has won its first two games, they’ve struggled in the first period of both contests. The Bobcats are going to have to be ready right from the drop of the puck, especially facing a team that has 11 NHL draft picks on their roster. It’s going to take a complete effort on both ends for Quinnipiac to win this game and that all starts in the first period. Boston College needs to take advantage of the slow starts from Quinnipiac and put some pressure on early. This Eagles team has so much talent and if they can take away home ice and make the Bobcats uncomfortable, it would go a long way towards getting a win. Playing from behind is not something the Bobcats do well and playing with a lead would give this Eagles team some confidence that they’ve been lacking.